I was excited to see this week’s Photo Challenge theme on Signs. I’ve always had a thing about signs and what they have to say about different cultures. I actually have a section on my blog devoted to them. They offer little insights and clues into a culture’s priorities, buying preferences, or sense of humor. Sometimes all three. I love noticing what they have to say about where I live, or at least the questions they raise. Often they leave me stumped too. The Greenply company manufactures commercial plywood. Quite why they would have a public stance on bad language is a bit of a mystery? In fact, what they are trying to say is a bit of a mystery too. After hours of uncomfortable staring at an otherwise blank wall, I’m still not clear on the point? Suggestions welcome! My other choice was this one. How to even begin?! Thinly veiled sexual innuendo, blatant false advertising (where is the “serving suggestion” label)…since when do Nepalis eat Thai noodles?… very odd indeed! Whoa–I’m a retired English teacher and that first sign has me stumped. Would be fun for students to deconstruct that one! I know. A real head scratcher! 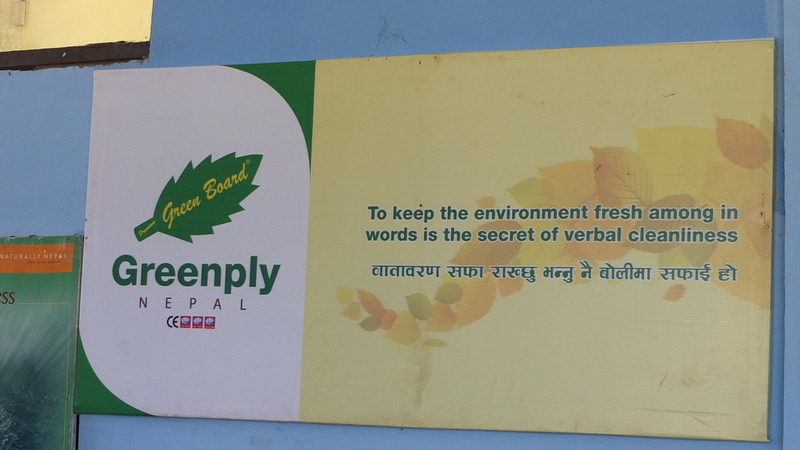 I’m going to have to ask someone what it says in Nepali.